Father Robert Jerrard, Director of Camp St. Malo Died Oct 27, 2004. He was 64. Robert Bruce Jerrard Jr. was born on March 22, 1940 in Canon City, Colorado to Robert Bruce Jerrard Sr. and Justina Marie (Anna) Jerrard. He attend Catholic grade and High School in Salida, Canon City, Greeley and Denver before entering and graduating from St. Thomas Seminary in Denver. He was ordained to the priesthood on May 28, 1966. 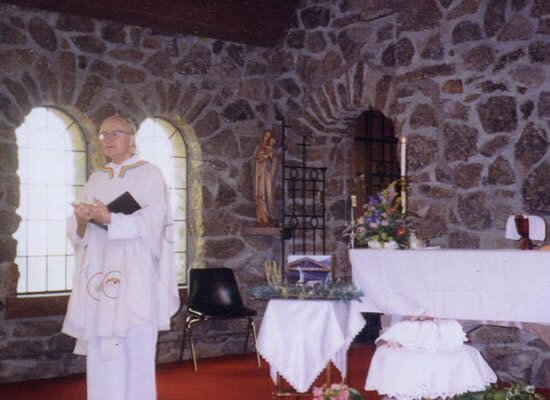 He served as an assistant pastor at the parishes of Cure d'Ars in Denver, Our Lady of Fatima in Lakewood, Our lady of the Mountians in Estes Park and Sacred Heart in Boulder. He was best known, however for the 15 plus years he served as director of Camp St. Malo from 1970-1985. In February 1982, while driving a busload of youth up to camp for a retreat, Father Bob stopped to help a driver who was stuck on Hwy 7 just west of Lyons. In the dark Father Bob did not see a culvert and plunged down it, suffering a broken rib, broken collarbone, fractured skull and a blood clot. Father Bob continued to lead Camp St. Malo another three years after the accident. Im 1985, Father Bob was asked to leave as Camp director and take an associate pastor position at St. Anthony of Padua in Denver. A brain tumor forced Father Bob to take medical disability leave in 1994. He continued to celebrate Masses, and was involved with the Neocatechumenal way the last nine years. He is buried at Mount Olivet Cemetery in Wheat Ridge.